I love Surry Hills! It is filled with so many good places, cheap or pricey. If I lived in Surry Hills, I think I would go broke from trying all that wonderful food. I could picture myself on a Saturday evening wandering from store to store and sampling all the food, a bit like a pub crawl but with food instead. 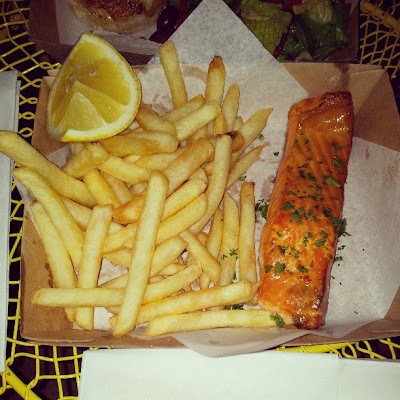 On a Tuesday evening, I wandered into Fish Place (70 Foveaux St, Surry Hills, NSW 2010) to try their famous house smoked salmon. You can miss this place because the exterior is covered in sardine tin prints (which I unfortunately did not take a picture of). ﻿The salmon was just beautiful! The smokiness in the slab of salmon is just amazing. The fish is really well cooked too: it was moist and succulent and nicely pink in the centre so the flesh was soft. This piece of fish was cooked much better than what I have seen at many fine restaurants. The only problem was that I wanted a bigger portion because I couldn’t get enough of it! The chips were OK but I should have ordered one of the other sides like the potato bake (which my wife got and it was pretty good) or the pea mash. Can’t wait to go back to Fish Place. Next time I will probably try the smoked trout and see how it differs from the salmon.